Don't let your most tasty treasured items take a back shelf in your convenience stores or exhibit floors. 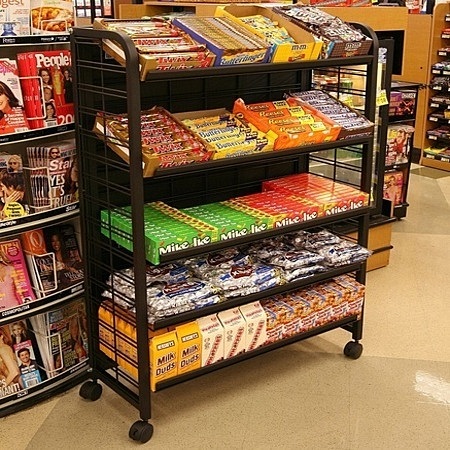 Bring them to the forefront or should we say Storefront with these premium candy display racks. 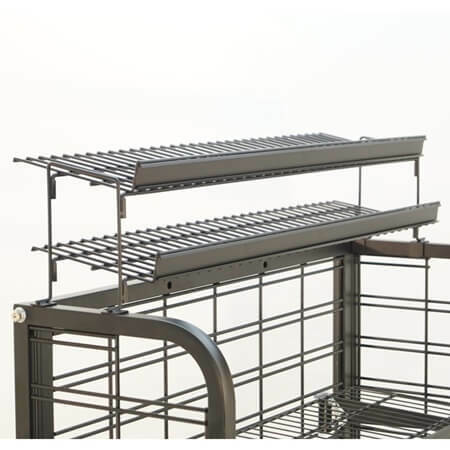 Metal mobile racks provide convenience without sacrificing the quality. Our sturdy and dependable display shelf comes with five metal racks but can hold up to seven in one sitting. Adjust your shelves to sit flat, at a slight angle or slanted deep. Don't just fill your display rack with candy though, fill them with an assortment of snacks from chips to pastries. Get your convenient floor fixture today. If this is not the right size for you, just click on the ones highlighted below. I have purchased 6 of your racks to date and they're working just fine and do the job well. It was a pleasure doing business with you and the service is great, cheers, Steve. My only issue was with shipping, I was guaranteed delivery by Friday and they got separated and got one box Friday, and one box Monday so we couldn''t even use it for our event.